Olympic champion Adam Peaty has challenged world governing body Fina to ban him after he backed plans to launch the new International Swimming League. The inaugural event had been due to take place in Italy this month, but was cancelled after Fina threatened to prevent those who raced from competing in next year's World Championships. "I don't care, ban me if you've got to," Peaty told BBC Sport. "I'm not bothered because at the end of the day they know they can't." The 23-year-old Olympic, world, Commonwealth and European champion added: "They can't get away with it because you'll lose all of the respect from the athletes and you can't bully them." 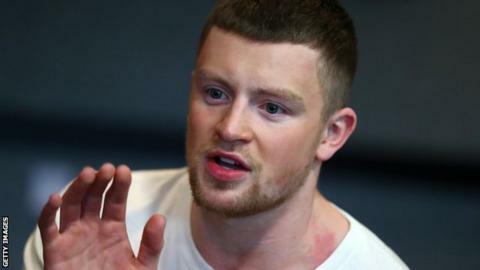 Fina stated that the International Swimming League (ISL) was unsanctioned and last week launched its own Champions Swim Series, but that only further damaged its relationship with some of the sport's leading athletes, with Peaty stating the decision was "embarrassing and offensive". A prize fund of about £4m is believed to be on offer for the Fina competition, but the ISL will offer swimmers a share of at least £10m with further incentives based on additional sponsorship and broadcast deals signed before the competition. Peaty said: "£4m in prize money is nothing in terms of what they'll make off that league - they'll make much more. "We need transparency and 50-50 split of the profits. "I love my sport to the moon and back but the main reason people quit swimming all over the world is because there isn't enough funding. "I want to secure the future for the kids who are going to be winning Olympics in 20 years and hopefully making a living out of it." Over 30 of the world's best swimmers met in London on Wednesday to back plans to launch the ISL in August next year, as well as to establish a swimmer's union which is independent from Fina. ISL backer Konstantin Grigorishin has joined with three swimmers - including Olympic champion Katinka Hosszu - in launching legal action against Fina in the USA relating to the governing body's monopoly of the sport. A similar move has not been ruled out in Europe, but he hopes Fina will acknowledge their vision and work with them, rather than against, in the future. "We have to recognise each other and respect one another," Grigorishin told BBC Sport. "It is easy to arrange our fixtures without conflict as they have only one major event per year and we must respect the athletes, but that is our perspective and maybe Fina has another one." The Ukrainian, who earned his wealth in the energy business, expects to be able to launch the ISL in August 2019 - one month after the Fina World Championships. The event is expected to see 12 teams - six from Europe and six from the USA - compete for places in season-ending grand finals in Las Vegas next December. Fina has been approached for comment relating to the announcements, but is yet to respond. "I feel like swimming has been stuck in the 1990s and we really deserve a lot more than we get," Swedish Olympic champion Sarah Sjostrom told BBC Sport. "Many swimmers can't even pay their rent. For me it's OK because I have sponsors but most swimmers work so hard but can barely afford to do it because they don't get anything from it and I'm talking about Olympic swimmers who have to rely on their parents - it's crazy and has to change." South African Olympic champion Chad Le Clos had made a considerable amount of money in recent years from Fina's World Cup series and admits being in conflict with the sport's international governing body is "difficult". However, he is adamant that international team competitions in the ISL is the "future of the sport" outside of major championships. The 26-year-old is also a passionate supporter of the ISL's stance not to invite any athletes who have served a drugs ban. "For me they have no place in the sport because why would you cheat," he told BBC Sport. "I've been denied medals by people who have later tested positive [for banned substances] and many other swimmers have to, so this is a great move."